Click on FEATURES to instantly see what PlainVanillaShell.com has in store for you editorially each week. 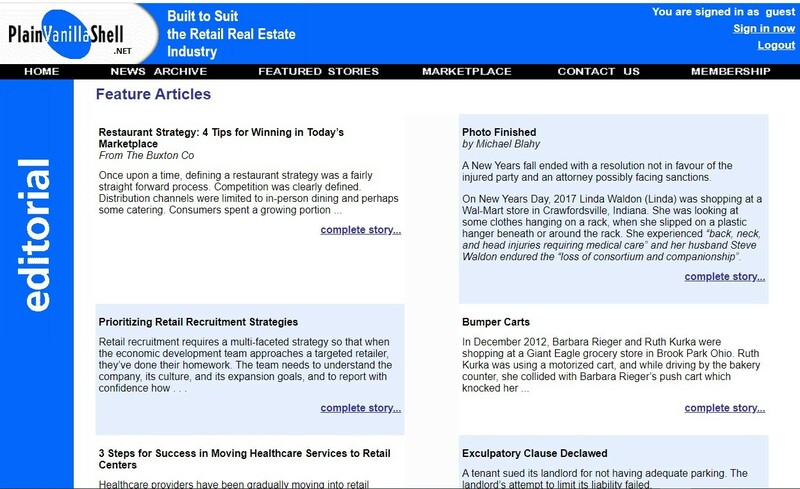 The three-column format allows you to quickly scan the beginning of all of the current articles and "click through" on the link at the bottom of each editorial piece to get the whole story. Plain Talk can alight on any topic relating to the industry - exciting new retail concepts, pressing issues facing center managers, intriguing mall events that should be duplicated elsewhere, and missteps that probably shouldn't. It's the retail world as seen by our Lead Editors, even if you don't share their views, you may well see some issues in a whole new light. Tenant Lead offers an insider's perspective on a different retailer each week. Our edtors take the industry knowledge he built through his work as editor of the Retail Tenant Directory and turns it into valuable insights on retailers' philosophies, strategies, expansion plans and site criteria, all wrapped up in a quick, easy-to-read, and entertaining format. The Law, written by noted real estate attorney Ron Davis, presents recent legal decisions affecting retail or retail real estate. Not only are the cases interesting in and of themselves - but the underlying precedents and knowing what factors tripped people up in court (and what saved their necks) could just prove to be invaluable information someday. In addition to the "full story" link at the end of each column, an "archive" link allows you to access any Plain Talk, Tenant Lead or The Law pieces you may have missed in the past or want to read again.